Please join us for #HouseParty50. It’s an open house at the R.B. House Undergraduate Library on November 2, 6 – 8 p.m., celebrating a half-century of learning and creating. Demonstrations, activities, food, fun and a chance to see how the UL continues to drive student success. In 1968, protests rocked the nation; “2001: A Space Odyssey” premiered in theaters; an IBM engineer fatefully asked about the microchip, “But, what the… is it good for?”; and the Robert B. 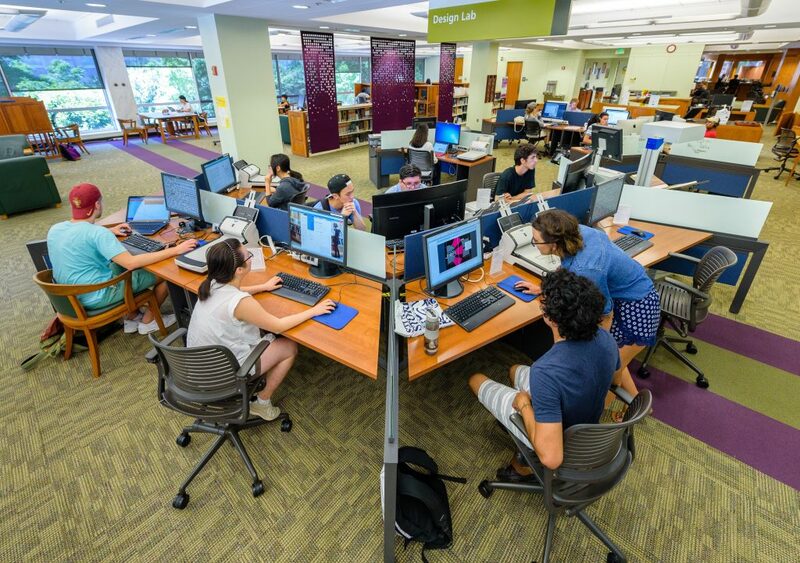 House Undergraduate Library opened its doors for the first time. The world has changed exponentially in 50 years, and the UL (as it’s popularly known) looks quite different, too. 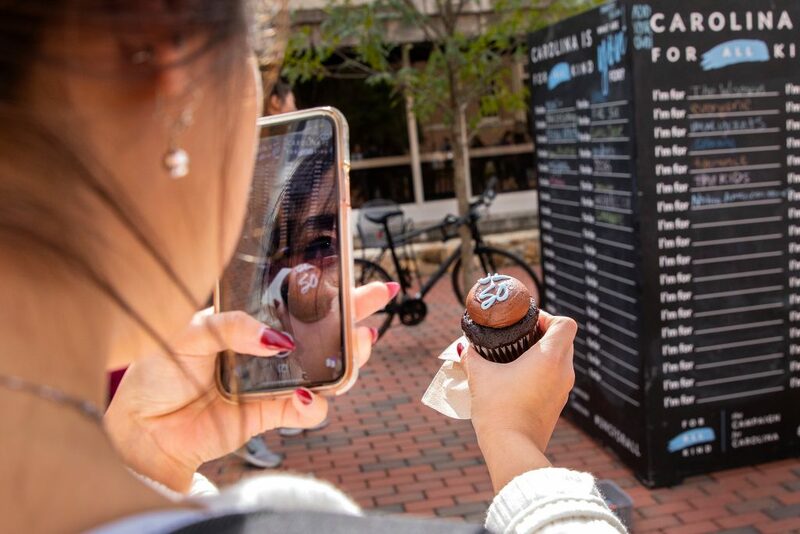 Even so, it remains true to its mission: ensuring the success of Carolina’s undergraduates and furthering learning and creativity in the University community. Rachel Schaevitz, postdoctoral fellow with Carolina Public Humanities, is one faculty member who has collaborated with UL staff to create undergraduate learning experiences that integrate the library’s technological resources. Schaevitz’s classes have created instructional videos for K-12 teaching and promotional videos for local nonprofits, learning from UL staff how to shoot, edit and produce a visual story. The recognition that students need these skills for educational and workplace success has led to fundamental changes in the UL’s footprint and offerings. The book collection is much smaller than fifty years ago, says Mohanty, because so much of what students need is online. Instead, new spaces and personnel help students master technologies and thrive in a digital world. The UL’s Media Resources Center opened in 2002 with a research-level media collection and a focus on audiovisual learning. Here students can borrow video cameras and microphones, edit video, make recordings in the audio studio or conduct an interview in the brand-new podcast studio. The Design Lab is similarly devoted to the teaching and learning of digital design. “We have continued to expand these spaces because of the demand,” says Mohanty. Where a written term paper once was the standard, she says, “students are being asked to communicate their research in effective, technology-forward ways.” To help them, the UL provides not only the equipment, but also the teaching and guidance to help students create infographics, podcasts, short videos and academic posters. Another hallmark of the UL’s approach is a focus on the whole student, with personal growth, well-being and stress management at the core. 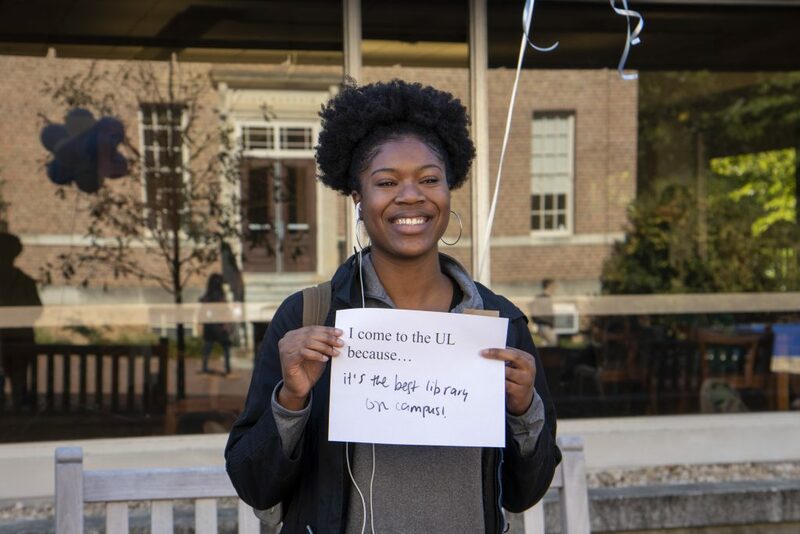 Programming outside the curriculum is one way the UL helps students make the most of college and prepare for life after graduation. For example, every year several hundred students stand in line to play miniature golf in the UL during Week of Welcome. The game serves as a fun library orientation and sparks friendships at a moment when many students feel alone. Non-credit workshops teach skills without tests or pressure. The SkillfUL Tech Workshops series focuses on technology with practical deliverables, such as creating GIFs or designing a visually effective résumé or online portfolio. Adulting 101, currently being piloted, offers sessions on topics such as budgeting, finding reliable health information on the web and researching political candidates and issues.